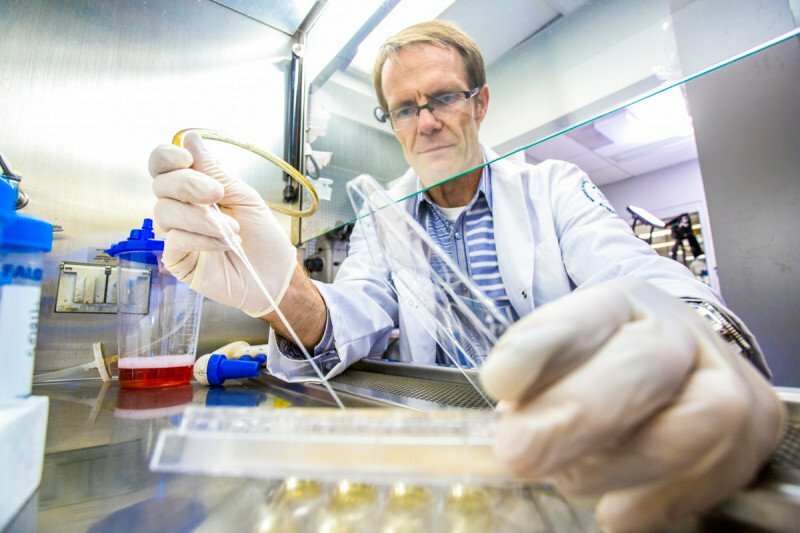 Developmental biologist Lorenz Studer was named a 2015 MacArthur Fellow. The award is intended to encourage people of outstanding talent to pursue their creative, professional, and intellectual projects and comes with a cash prize that can be used however the recipient sees fit. MSK’s Lorenz Studer is a 2015 MacArthur Fellow. His work centers on stem cells. He is the founding head of MSK’s Center for Stem Cell Biology. Other recipients include artists, writers, scientists, and entrepreneurs. Memorial Sloan Kettering developmental biologist Lorenz Studer has been named a 2015 MacArthur Fellow by the John D. and Catherine T. MacArthur Foundation. Known as the “genius grants,” the awards are given to people in a variety of fields who have shown exceptional originality in and dedication to their creative pursuits. Dr. Studer investigates human stem cells as tools that can be used to understand development in the nervous system and to develop strategies to treat degenerative diseases, such as Parkinson’s and ALS, as well as cancer. One major focus of his lab is devoted to harnessing and manipulating the potential of human pluripotent stem cells, which have the ability to form any type of cell in the body. He is also the founding head of MSK’s Center for Stem Cell Biology. As part of his award, Dr. Studer will receive a $625,000 stipend over five years. MacArthur Fellows are nominated anonymously by leaders in their respective fields, considered by an anonymous selection committee, and given the cash award to spend however they see fit. This year’s 24 winners include a neuroscientist, a choreographer, an economist, and an environmental engineer, among others. Learn more about the MacArthur Foundation, which bestows these annual awards, and read more about Dr. Studer’s selection. MSK and Dr. Studer's research is immeasurably amazing and I hope to be considered a candidate when the human trials begin for stem cell therapy for Parkinson's. Thank You for all the work in this field. Many of us now aging and facing these debilitating diseases now have some hope. Keep up the wonderful work. Congratulations for both of you. and I think they deserve this honor and they also have contributed a lot in this field.